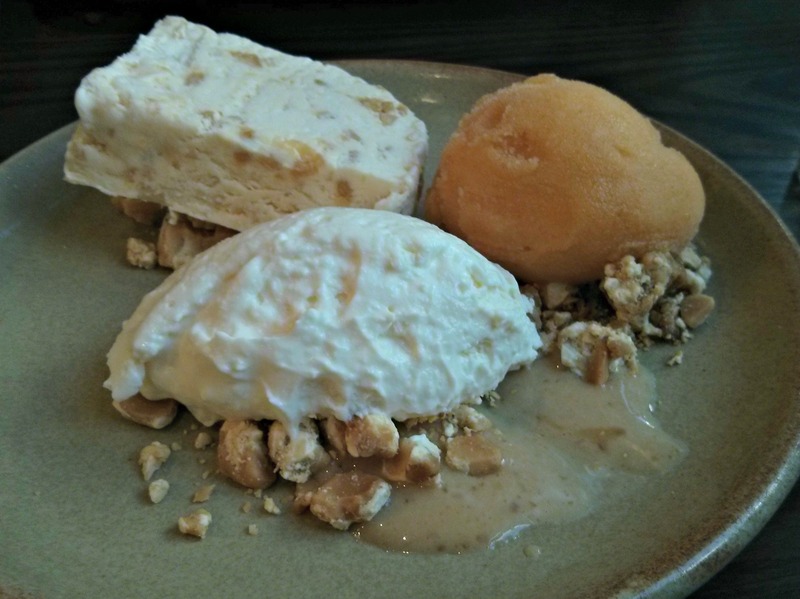 Grain Store is the all day restaurant from Bruno Loubet, part of the regeneration area behind Kings Cross. I'm more than familiar with the area, being a regular visitor to the now defunct Cross and Bagleys clubs that were there in the Nineties but now the area has changed beyond all recognition, the walk from Kings Cross taking you through a collection of building sites and over the Regents Canal to the finished Granary Square area, home to Grain Store, Caravan, Kerb and St Martins College of Art and Design. The restaurant retains its original warehouse dimensions, a large industrial space with bar and open kitchen, and was already busy when we arrived at midday. The menu is interesting, with a focus on vegetables, and the meat or fish element being mentioned last on the dish description and a large selection of vegetarian and vegan dishes. There's also a cocktail menu with savoury and sweet cocktails, and some unusual herb infused and smoked wines. I started with lobster "Bloody Mary", with an accompanying plate of potato and rye bread, a fantastic slice spread with a umami rich seaweed butter and dense leafy covering of borage, oyster leaf, flowers and some hairy plant I didn't recognise. Hats off to Grainstore here, even though it had no noticeable fish or meat ingredients it was not labelled as vegetarian on the menu due to the parmesan in the seaweed butter. The lobster dish was a timbale of lobster and green, yellow, cherry and red tomatoes around which was poured a consomme of tomato and vodka. 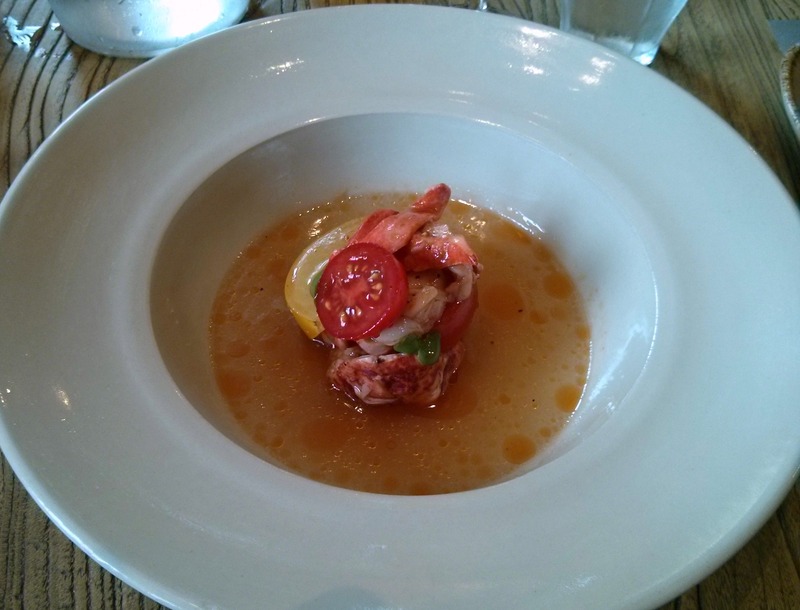 The consomme was excellent, intense with flavour and the tomatoes a nice mix of crunchy, soft and sweet. The lobster itself was cooked to perfection, soft as a pillow. 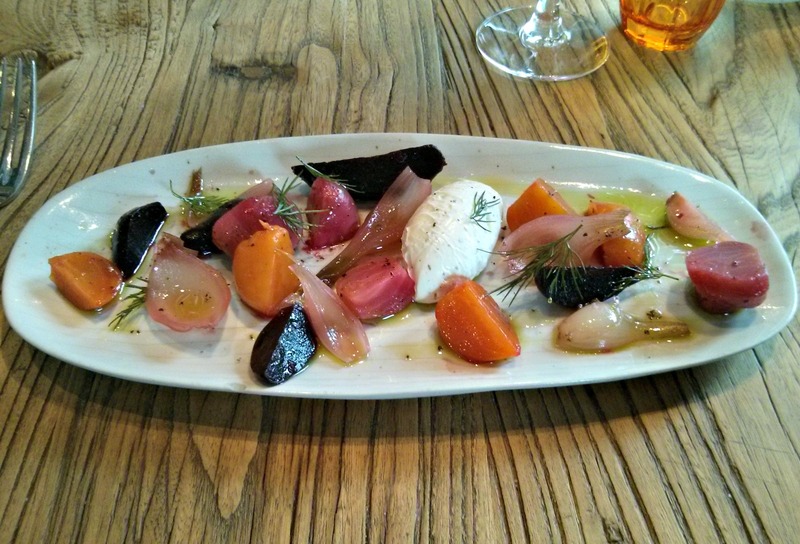 My wife had a lovely looking plate of baked beetroots; orange, candy and red, goats labneh, pink pickled onions and a dill dressing. The mains kept to the same high standards, for my wife a dish with a poached egg, a type of cheese, a spiced crushed nut mix called dukkah and a white bean hummus and had some very good feedback, a really delicious dish. I had a cast iron pan containing gratin dauphinois and topped with rabbits leg and salsa. The dauphinois was heavenly, creamy, garlicky potatoes and topped off with a beautiful piece of rabbit cooked under a Josper, soft and juicy, timed perfectly and with the pleasing smoky barbeque flavours from the Josper. The salsa verde was more guacamole than anything, lots of avocado mixed with the herbs and pickled jalapenos. You wouldn't have thought it would go with dauphinois and rabbit but it provided a pleasing creamy topping to the rabbit amd worked perfectly. The dish was utterly wonderful, supreme comfort food and just right for a damp September morning. The dessert menu featured some unusual vegetable ingredients, horseradish ice cream and strawberries in one dish, and the the one I choose featuring spiced candied tomatoes and goats milk panna cotta. The tomatoes were actually whole cherry tomatoes, and whilst retaining a hint of tomato the sweetness from the candying process and spices provided a taste unlike anything Ive had before. 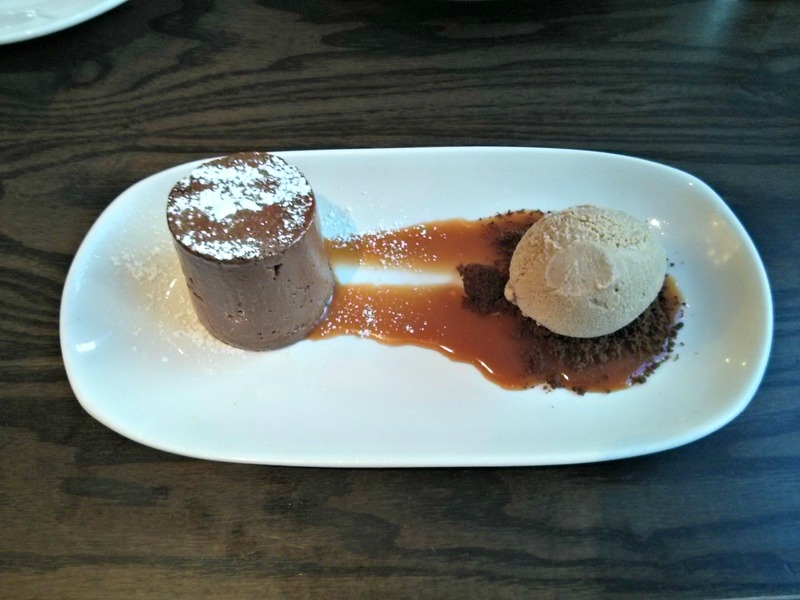 The panna cotta was of excellent quality. My wife had white chocolate rice crispy cake chocolate mousse and almond ice cream. 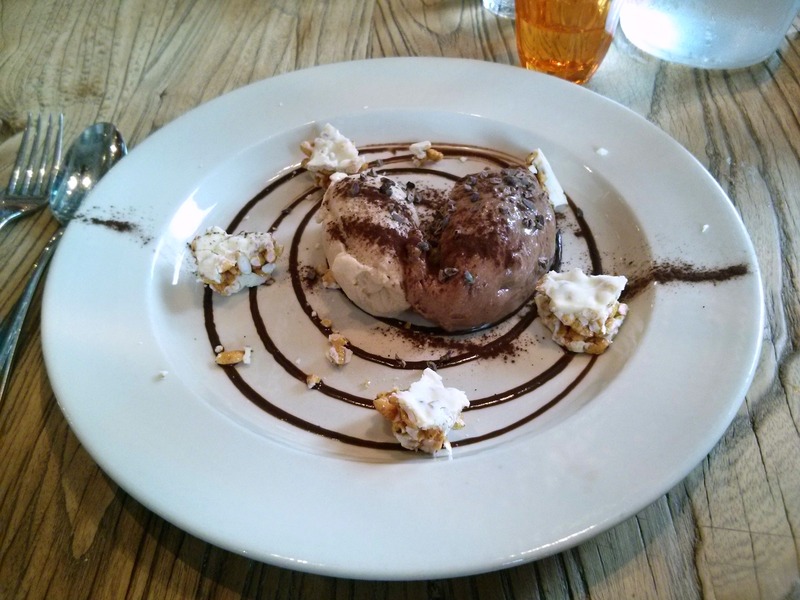 This was an excellent plate, in particular the lovely crispy cake and ice cream. Grain Store is a popular place, when we left it was full and for good reason too, a whole menu of highly original and innovative dishes can be found and some really good food. I look forward to returning. Kings Cross and Saint Pancras, once desolate wastelands as far as food is concerned, now have a number of good places to eat and Grain Store is certainly one of the better choices. The bill came to 85 quid and included a £1 covercharge for water, two cocktails and service, not bad considering I had the most expensive starter and main and the quality of the meal. 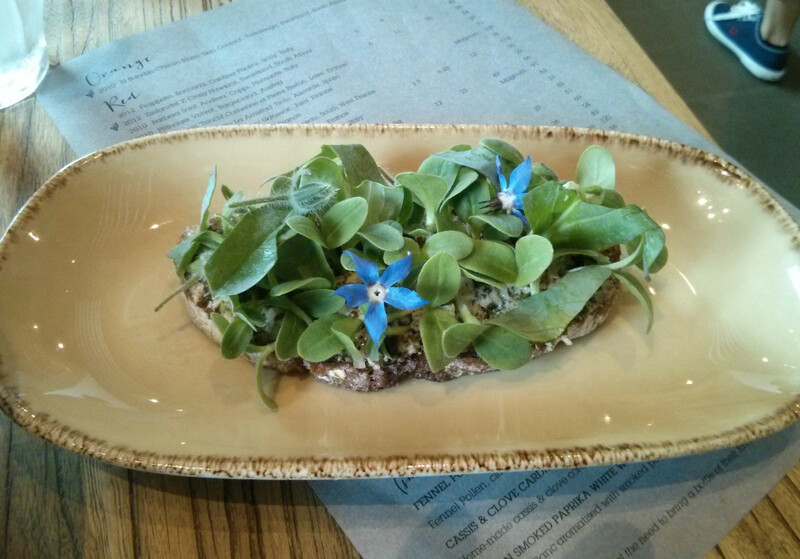 Potato and rye bread, borage, oyster leaf. 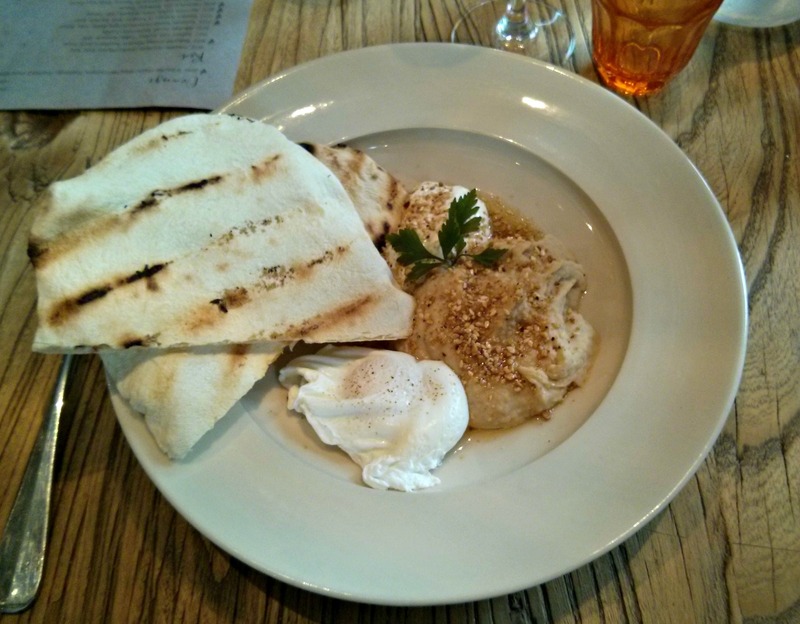 Flat bread, poached egg, white bean hummus. 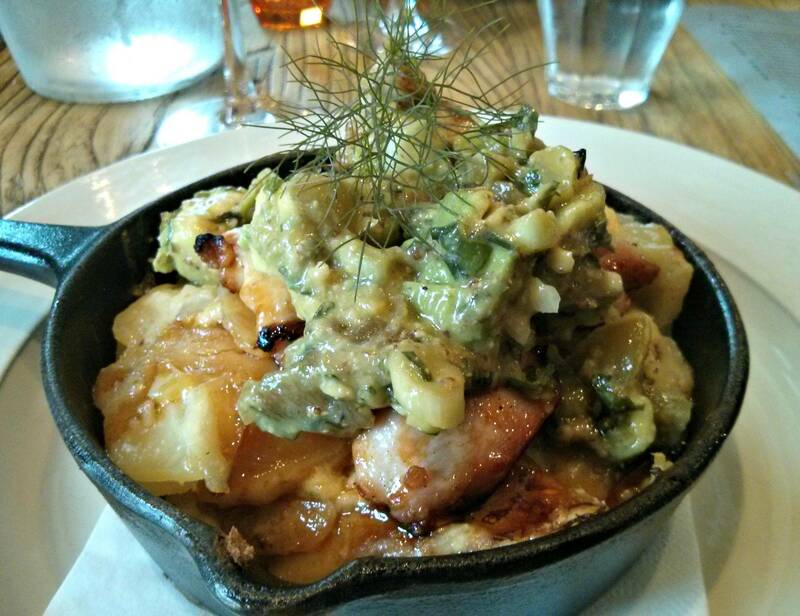 Gratin dauphinois, salsa verde, rabbit leg. 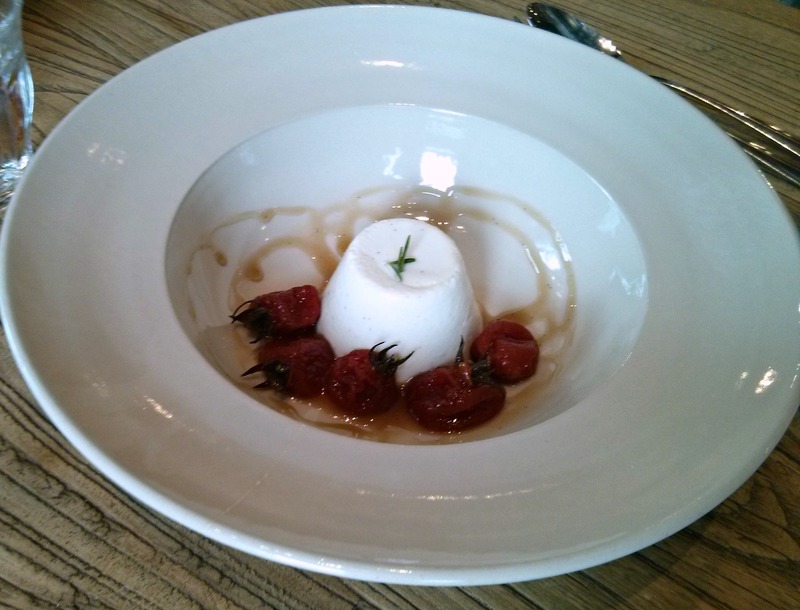 Spiced candied tomatoes, panna cotta. White chocolate rice crispy cake, chocolate mousse, almond ice cream. A trip to the El Bulli exhibition at Somerset House saw us stopping for lunch in Covent Garden at the Opera Tavern, a Spanish restaurant in the Salt Yard Group. Opera Tavern differs from the other restaurants in the group, Dehesa and Salt Yard, in having a charcoal grill and specialising in Ibérico pork dishes as well as tapas. We started with 2 glasses of a pleasant Manzanilla Pasada, as my sum experience of sherry to date has been a sip of my nana's Bristol Cream and I wanted to try something proper as it was all the rage a while back. The first plate, some butternut squash and sage croquettes with a quince alioli was a perfect start to a meal, smoky, buttery and sweet, topped off with a great alioli and utterly delicious. Following this a hunk of roasted salt cod on a base of compressed and crispy black rice, with a tomato sauce and basil sauce around it. This was a lovely piece of fish, and the rice beneath gorgeous, crisp, sticky and unctuous perfectly matched with the tomato and basil. 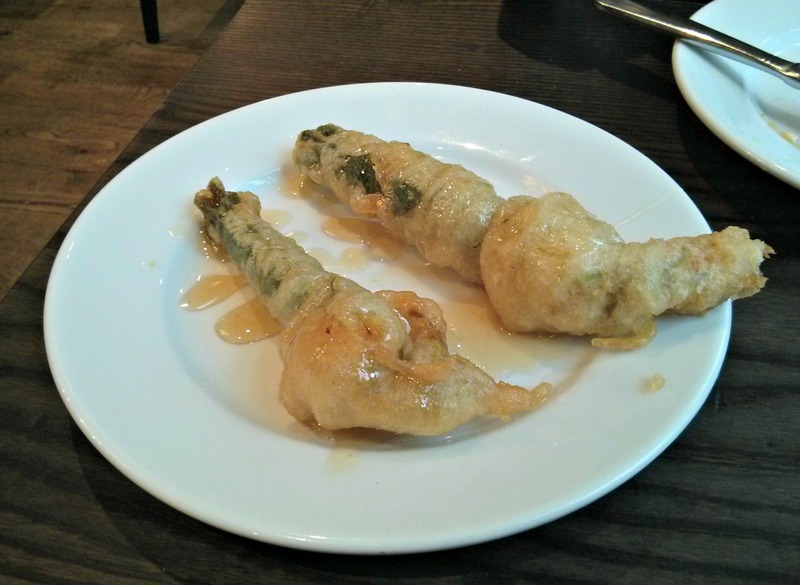 My wife's plate of courgette flowers stuffed with goats cheese was fabulous, the courgette flowers in a tempura batter and generously covered in honey, top class stuff. 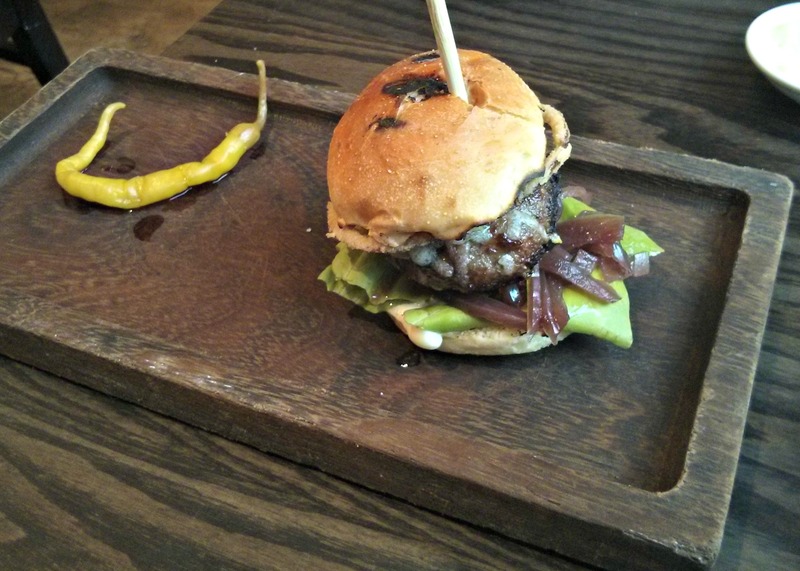 I tried the mini Ibérico burger with foie gras, done on the charcoal, feted as one of the better burgers in London, and well, wow, a triumph of a burger and well worth at the top of any list. The burger was gorgeous, smoky and so juicy I left a pool on the plate as I bit into it, with fantastic onion rings and jam and brioche bun. 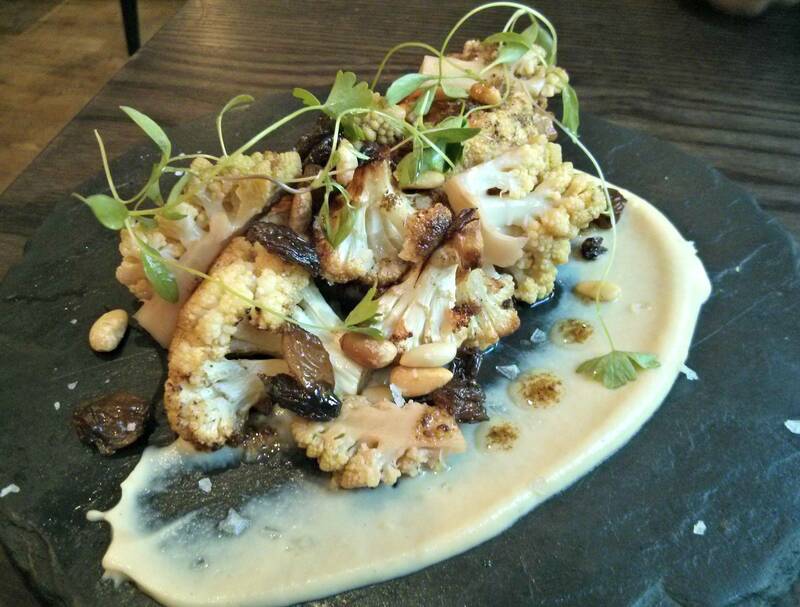 The last dishes to appear were a plate of roasted cauliflower with cumin, pickled romanescu, raisins and pinenuts for my wife, a pleasant combination, with a nice mix of spice and sweet. I had a plate of Ibérico presa, cooked medium rare on the grill, smoky and rich in flavour, and with a drop dead gorgeous sauce of shallots, capers and lemon, thick, sticky, sweet and tart. I have to say this was one of the best meat dishes I have ever had, astonishingly good, not just for the presa as the sauce was amazing. We then tried a plate of 3 Manchegos, with some melba toast and quince and walnut jam. 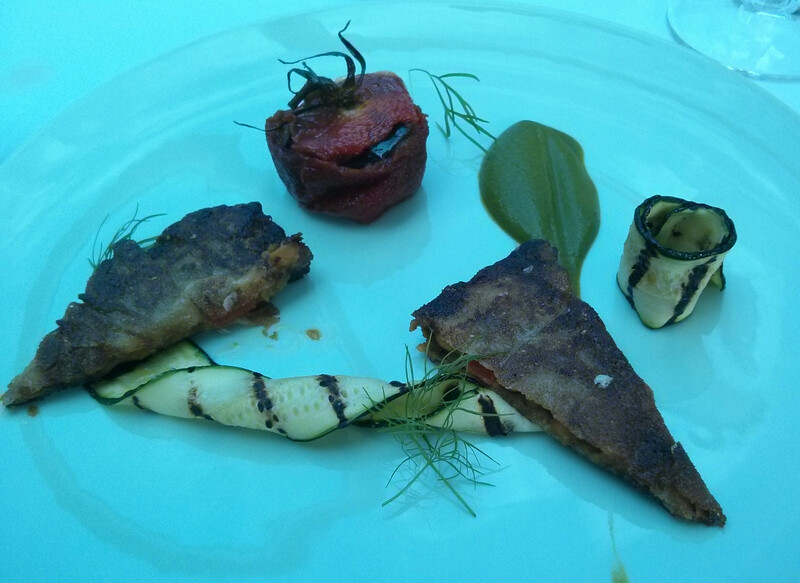 I'm a big fan of Manchego and really enjoyed the one with rosemary. Pudding saw us indulge in a few puddings, the cold chocolate fondant with salt caramel, espresso ice cream and coffee crumb and a parfait of Turron, a Spanish nougat, with yoghurt ice cream and apricot sorbet. The chocolate dessert was lovely, rich and filled with an excellent salt and PX caramel, but the Turron parfait was the better of the two, a gorgeous combination with the sweet parfait, tart sorbet and an almost cheesy yoghurt accompanied by a crunchy bed of praline. 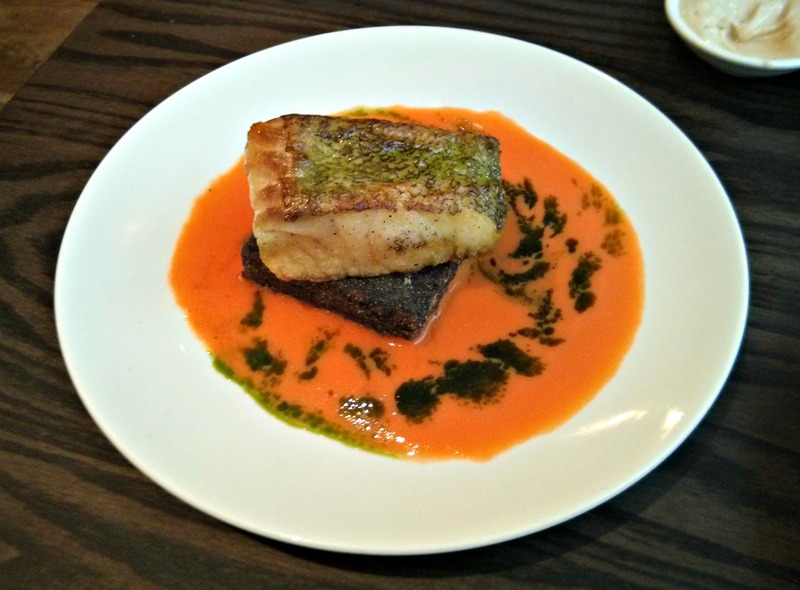 The meal served as a reminder that I focus too much on certain types of restaurants, with the majority of my write ups being longer tasting menus and more formal dining, and that I need to spend some time trying some tapas and less formal places. 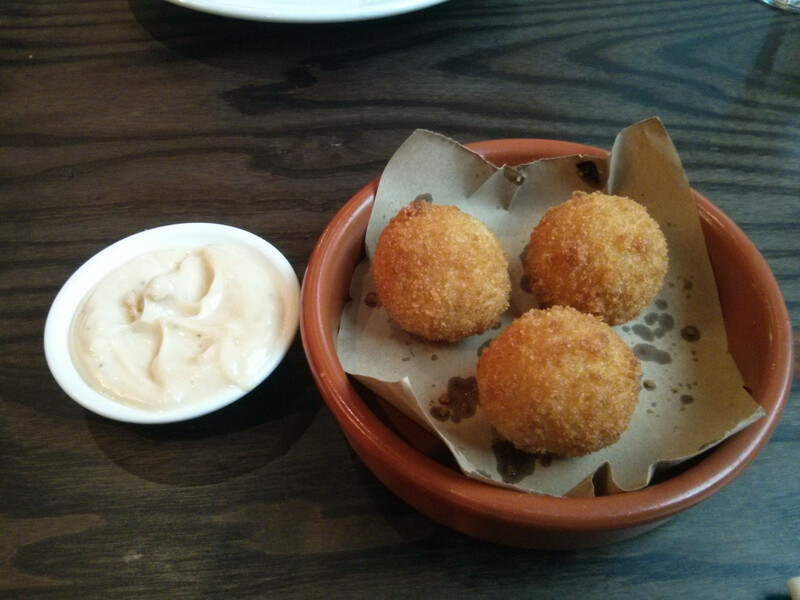 The two Ibérico pork dishes, the burger and presa, were as good as anything I've had before, stand out dishes that will see me return next time we're in the West End for certain. The bill came to £117 and included 2 sherries, 2 peach bellini's. 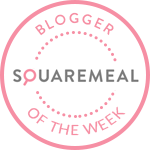 Butternut squash and sage croquettes. Courgette flowers stuffed with goats cheese. Mini Ibérico pork and foie gras burger. Midsummer House, set on the picturesque Midsummer Green on the edge of the River Cam in Cambridge, is the 2 star restaurant of the very talented Daniel Clifford. We had to park on the other side of the river and cross a footbridge to get to the restaurant and ended up parking just near the house my mother was brought up in. The main room is the conservatory of Midsummer House, with a walled garden surrounding it, a light and airy environment. 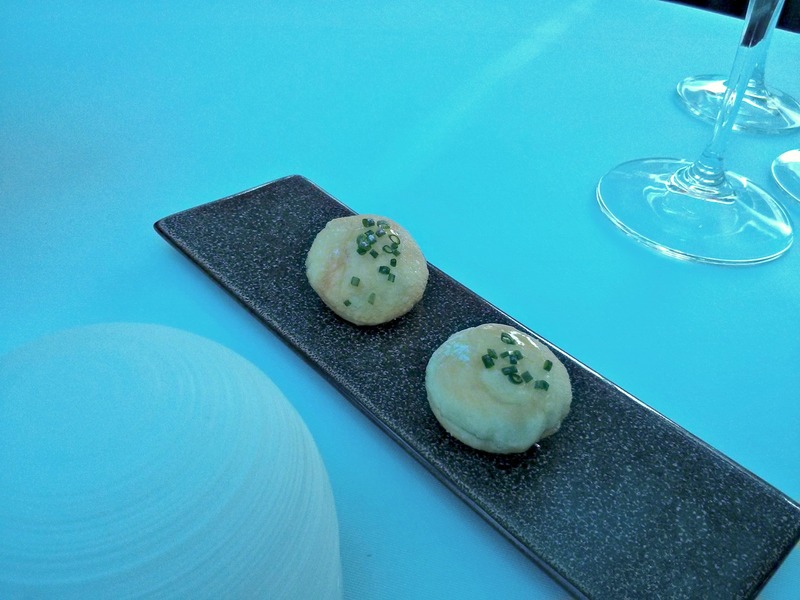 There is a choice of lunch, a 7 course Taste of Market menu and an 8 course Taste of Summer House menu, we went for the vegetarian and standard versions of the Taste of Summer menu. 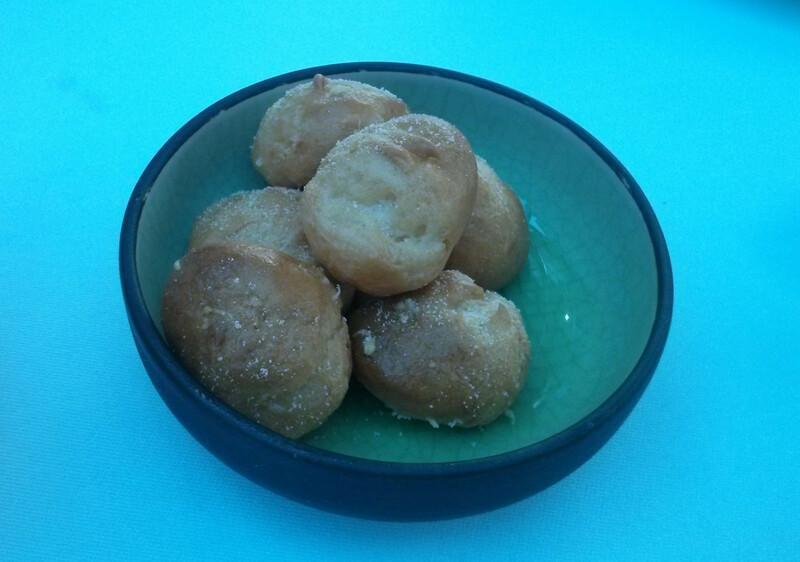 Canapes were brought out whilst deciding on the menu's, a puree of tomato and vodka, essentially a slightly thicker bloody mary, fresh and flavourful, some fabulous cheese gougeres and an incredible pomme souffle filled with sour cream. I immediately knew we were in for a good meal, these were canapes of the highest order. 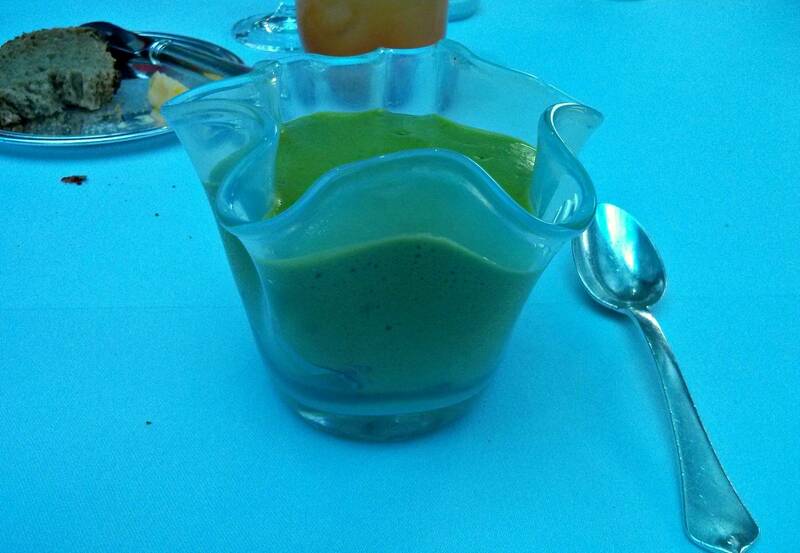 The amuse bouche was a light mousse of peas, with tomato underneath, and for me, prawns too. The mousse was incredibly light, more or less a foam, with an exceptionally deep pea flavour, with some tomato and some really excellent prawns. The next course started table side, with the waiter spooning dried mushrooms and herbs into a cafetiere and adding mushroom stock, this was left to infuse on the table. 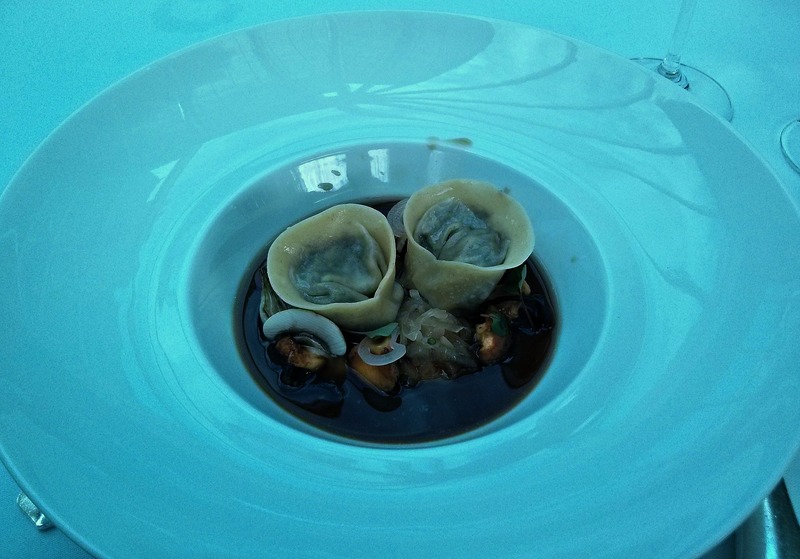 The dishes arrived a few minutes later, for my wife some plump mushroom tortellini accompanied by girolles and herbs, the consomme from the cafetiere was then poured on. The tortellini and consomme were really good, with a huge depth of flavour, about as good a pasta as to be found anywhere. 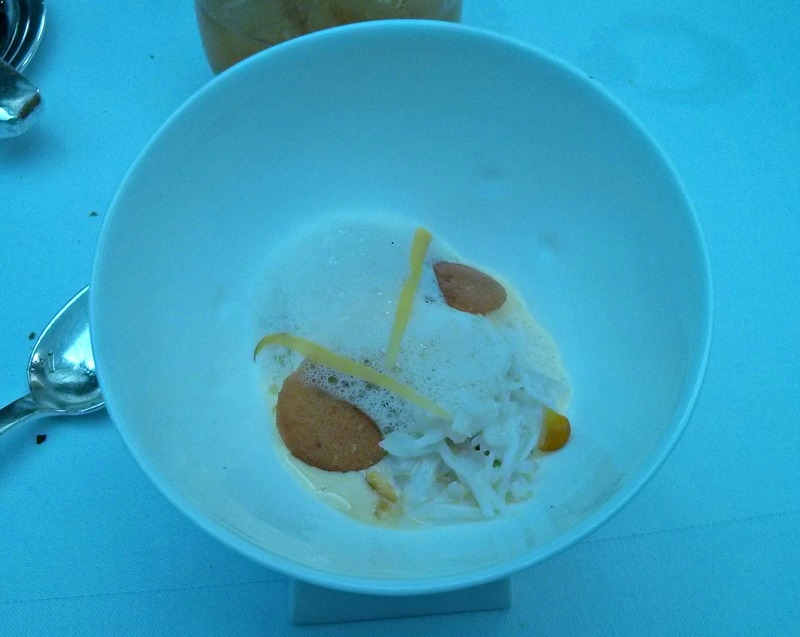 For me, a bowl with Cornish crab, mayonnaise and a sweet corn ice cream. The crab was really nice, fresh and flavoursome and I absolutely adored the sweet corn ice cream, a flavour I'm used to from my days in the Far East, but here refined and perfected like no other I'd had before. The next course involved a little bit of theatre, a table inset with one of those Green Big Eggs, a fancy ceramic barbecue, was wheeled over, and 2 plates set, one of the chefs then came out and removed a whole roasted beetroot, and explained a little of the concept of the dish and how it was roasted for over 2 hours that morning in one of the Green Eggs. 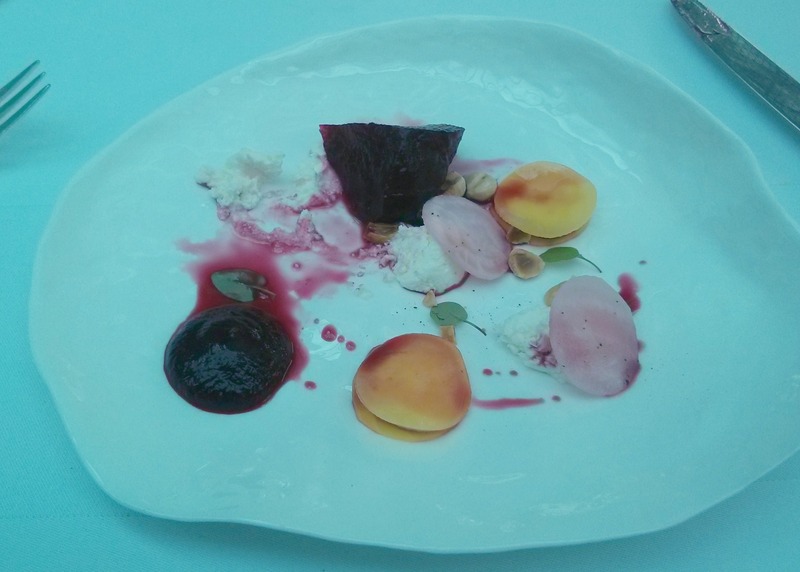 The beetroot were sliced in half and a semi-sphere scooped out and added to the plate, which also included sheeps curd, horseradish, beetroot puree and hazelnuts. The beetroot was superb, wonderfully flavoured, the curd, horseradish and other accompaniments partnered it perfectly. 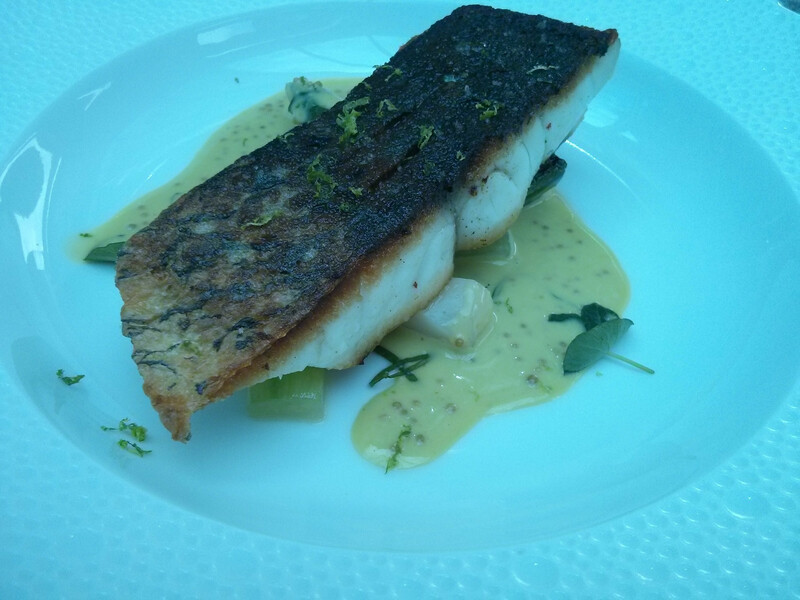 The fish course was roasted stone bass, with razor clams, cucumber, wasabi and sorrel, with a grating of lime zest at the table. The cooking of the fish was spot on, with a gorgeous crisp skin, and I also loved the razor clams, cucumber and wasabi an excellent match for this fish. 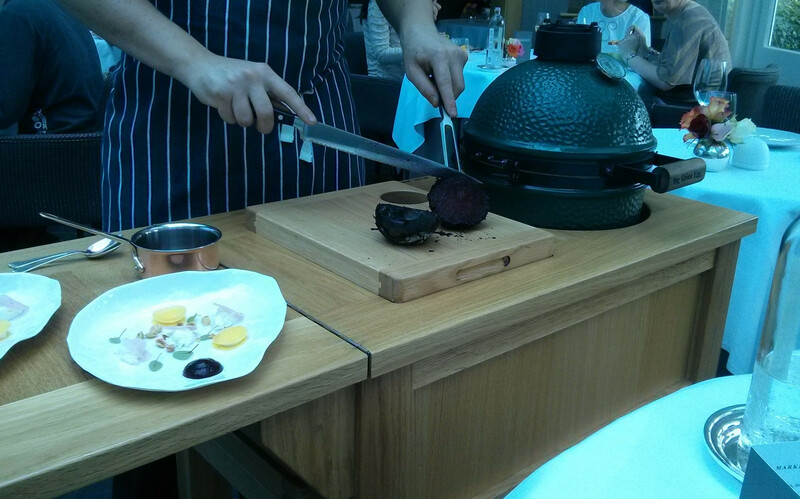 What stood out was the scents and flavour added by the grating of the lime at the table, elevating the entire dish to stratospheric heights. My wife's dish was a confit stuffed tomato. with courgettes and subtly spiced vegetables in a crispy sandwich. 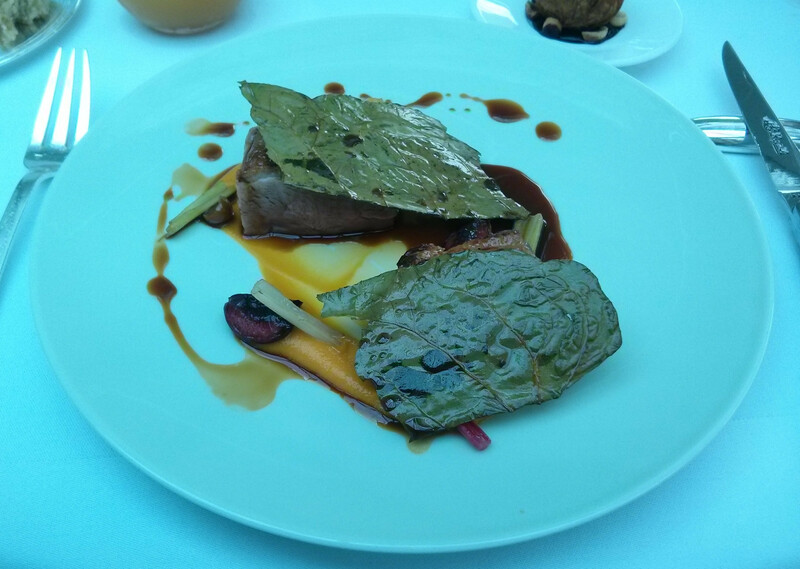 Our main courses were again of very high quality, for me duck, cherries, sweet potato puree, hazelnuts and a tamarind gravy, with 2 crispy green leaves and a side dish of croustillant of confit duck on a bed of hazelnuts. The duck was superb and the gravy a shiny, unctuous, lip-smacking delight of a sauce, absolutely world class. I never found out what the leaves, were, but can confirm they were delicious. The croustillant contained a hidden surprise, a whole cherry! 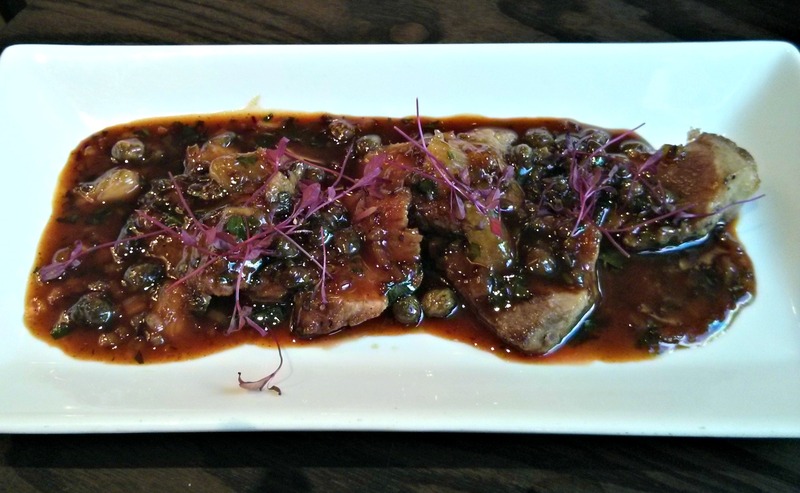 The juicy cherry and rich confit duck was a match made in heaven, top stuff. 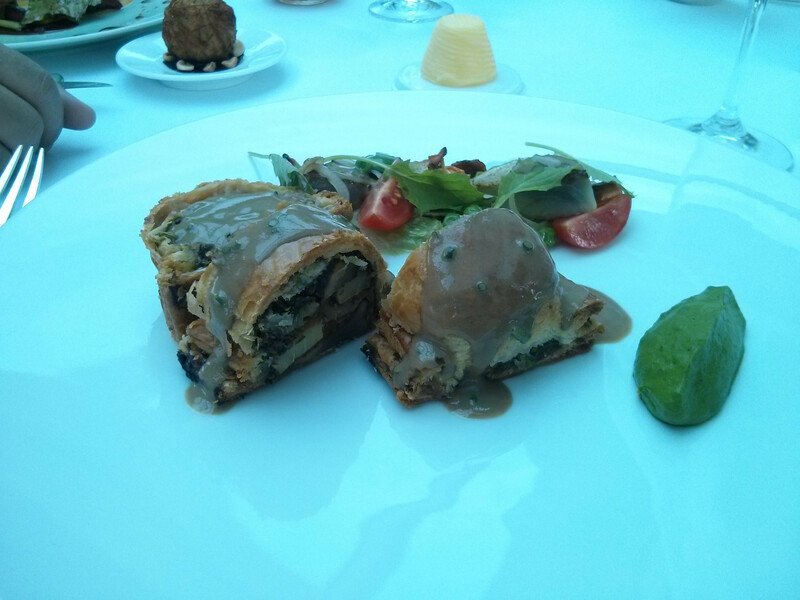 My wife's main was a pithivier of vegetables, with a side of vegetables, puree and sauce soubise. 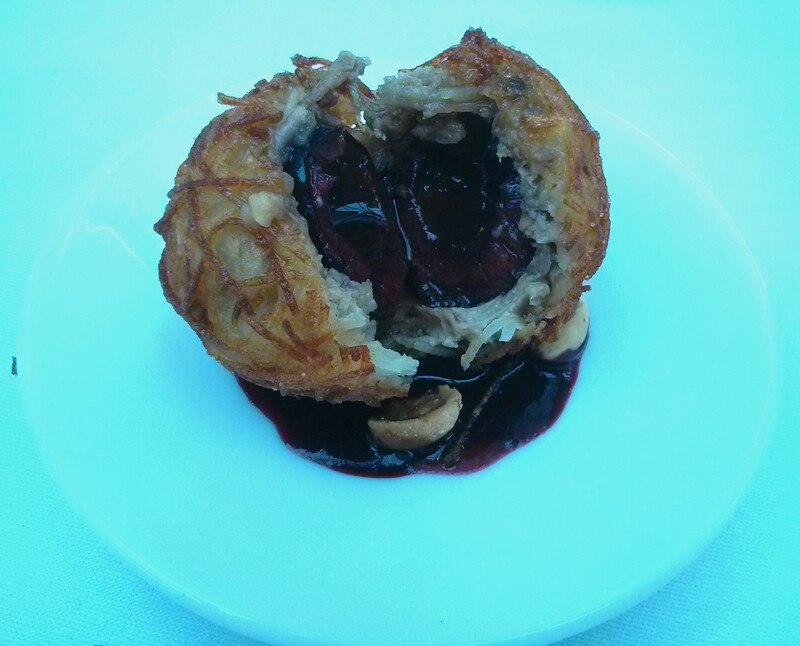 This was excellent pastry work, and essentially as perfect a pasty as you will get. 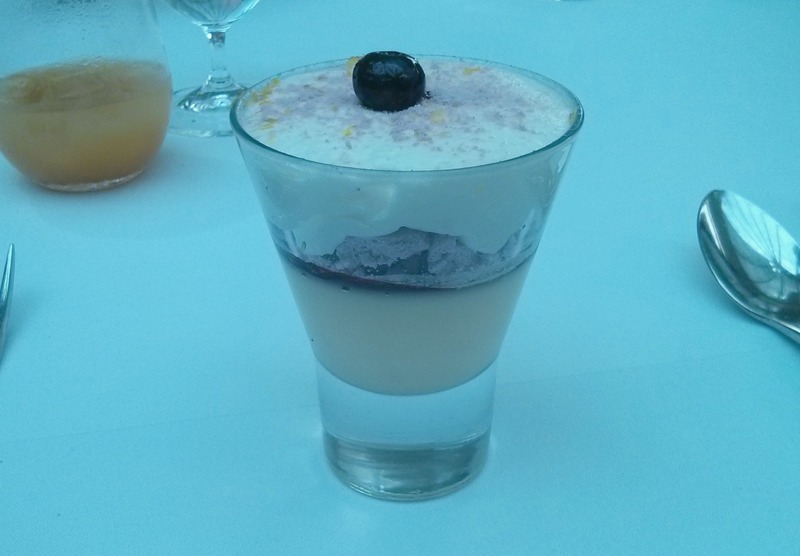 Pre-dessert was a lemon posset, with blueberries and lemon espuma. Lovely flavours here, and the blueberries were really something, I believe they had been frozen in liquid nitrogen then smashed, and were a lovely delight hidden within the excellently flavoured posset and foam, both sweet and tart. Dessert itself was a wonderful dish of strawberries, creme fraiche ice cream, an elderflower mousse in a cannelloni of strawberry, little cubes of shortbread, jellies and strawberry juices poured at the table. Every element was executed perfectly, and as good as summer treat as can be. A lovely finish to the meal. We took coffee upstairs in a small lounge area with an external balcony, although a tad warm, I'm not sure why the radiators were on in the middle of a long August heatwave. 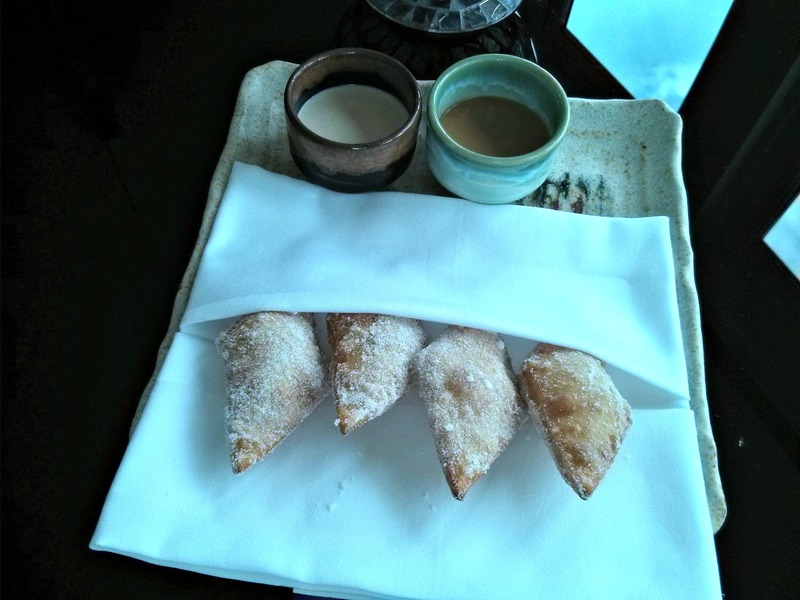 The petit fours were different, warm sweet pastries laid out on a tray with 2 dips, one caramel and one of Calvados cream. The pastries were again top quality, incredibly light and crisp, and perfect for the dips, my favourite being the Calvados cream, awesome flavours there. Finally, a large wooden box loaded with chocolates was brought up and we chose 5 each. 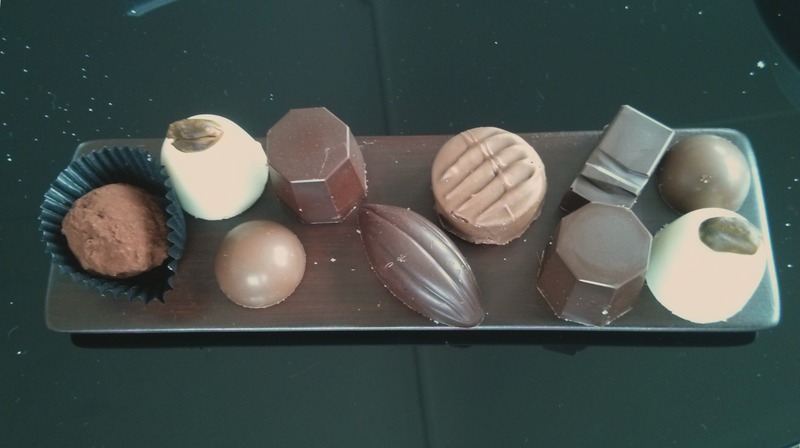 As with the rest of the meal, these were delicious, especially the lovage and bay leaf chocolates, 2 flavours I've not had the pleasure of trying before. The bill came to about 230, and included 2 glasses of champagne, soft drinks for me and 2 glasses of white for my wife. We loved Midsummer House, with its gorgeous riverside setting, world class service and as good as food as we've had anywhere. Every aspect, from the ingredients to the execution was of the highest order, and there were some real stand out dishes. I can't wait to return. English peas, tomato and prawns. Cornish crab, brown crab mayonnaise, sweet corn. Beetroot cooked on open coals, sheep's curd and horseradish. Roast wild stone bass, razor clams, cucumber, wasabi, sorrel. Stuffed confit tomato, courgette and basil. Slow roast duck, English cherries, sweet potato and tamarind, hazelnuts. Pithivier, seasonal vegetables, sauce soubise. Lemon posset, blueberries, lemon espuma. 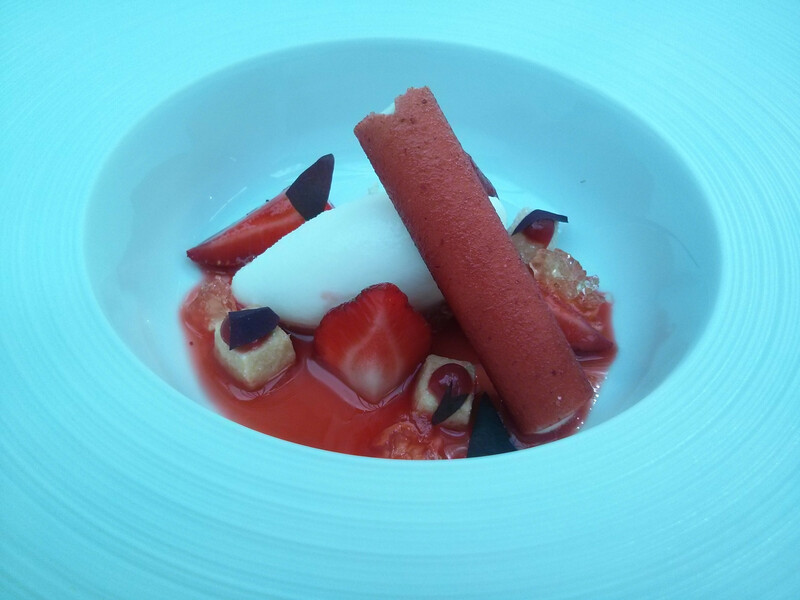 Cambridgeshire strawberries, elderflower, creme fraiche, Scottish shortbread. You can spot that from the strawberries onwards I realised the filters on camera were wrong.